Northville’s Amerman Elementary School has earned “Lighthouse School” status as part of the transformational The Leader in Me model, a whole-school transformation process – developed in partnership with educators – that empowers students with the leadership and life skills they need to thrive in the 21st century. 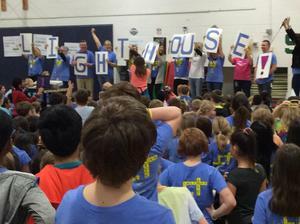 With this achievement, Northville Public Schools becomes the first school district in Michigan – and one of only two nationwide – to have all of its elementary schools reach the Lighthouse School milestone. The Leader in Me starts with the powerful premise that every child possesses unique strengths, and has the ability to be a leader and have a voice in their learning. It integrates leadership development into existing school programs, curriculum, and traditions; and helps students learn how to become self-reliant, take initiatives, set goals, prioritize their time, present their viewpoint persuasively, value differences, resolve conflicts, and find creative solutions. The Lighthouse designation represents a significant benchmark in The Leader in Me journey that recognizes outstanding results in school and student outcomes. The Leader in Me utilizes and integrates several leadership, social-emotional learning, quality, and educational models and processes, including The 4 Imperatives of Great Leaders and The 4 Disciplines of Execution, and The 7 Habits of Highly Effective People, which is a key component of the process. It is based on principles of personal, interpersonal and organizational effectiveness, such as responsibility, vision, integrity, teamwork, collaboration, and renewal. The process also includes student participation in goal setting, data tracking, leadership roles, student-led conferences, leadership environments, and leadership events. The Amerman school community began its The Leader in Me journey five years ago beginning with the Lighthouse School process of self-evaluation. This included putting together Lighthouse teams of students, staff, parents and community members to oversee school-wide implementation; building cultures of leadership and learning throughout the school; teaching and reinforcing the 7 Habits; working together collaboratively; having students in meaningful leadership roles; involving parents; creating and holding leadership events to share the school’s leadership model with the community; using data through leadership notebooks and other leadership tools; and showing measureable results. "Since joining the staff three years ago, I have had the privilege of watching the students at Amerman grow as leaders,” Mr. Marando said. “The Student Lighthouse Team has grown a tremendous amount with students advocating for teams based on the needs of our school. With the increase in student leadership opportunities, the level of staff support has also been amazing. “The Amerman students and staff have worked wonderfully together to promote many initiatives such as acts of kindness, Bobcat Boosts, food drives, and donating to charities just to name a few,” Mr. Morando added. “I would also like to thank our PTA and entire parent group for their continued support and devotion to learning with the whole child in mind. 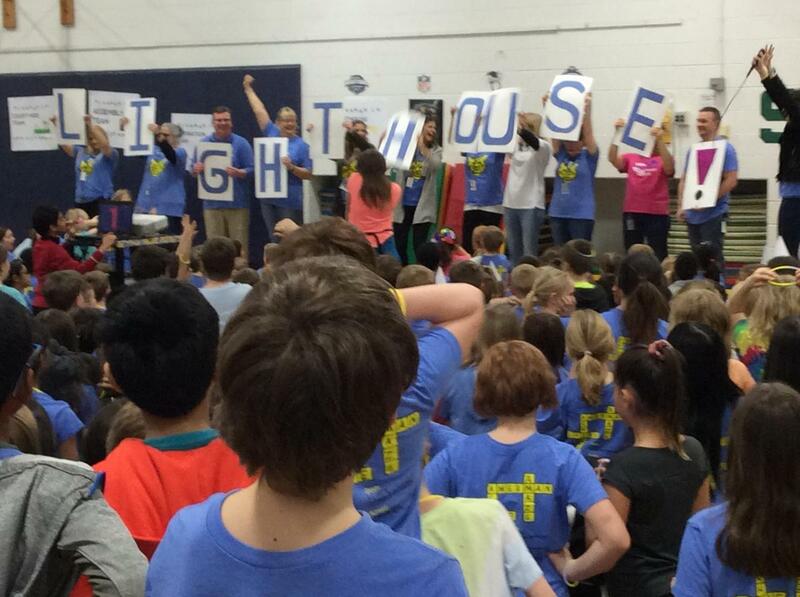 Receiving Lighthouse School status was a team effort. The synergy is evident as you walk the halls at Amerman. Congratulations to the Amerman team on this Lighthouse achievement. Go Bobcats!" “We applaud the Amerman school community for achieving the distinction as a Lighthouse School,” said Northville Superintendent Mary Kay Gallagher. “This is powerful work that brings students, teachers, parents and families together with a collective focus on learning in a way that unleashes the leadership capacity and potential within every learner. Following the Amerman dance party, elementary principals and Lighthouse team leaders from across the district’s six elementary schools gathered for an inspiring, celebratory conference call with FranklinCovey Education President Sean Covey, recognizing Northville as the first school district in Michigan – and only the second nation-wide – to have all of its elementary school schools earn the Lighthouse distinction. The Leader in Me recently earned the endorsement of the Collaborative for Academic, Social Emotional Learning (CASEL). This designation is given to effective socio-emotional learning programs that meet the organization’s high-quality, evidence-based standards. When applied to the educational setting, social emotional learning strengthens the development of vital skills, including responsibility, resilience, focus, goal-setting, prioritization, empathy, communications, collaboration, and motivation. Of the 22 CASEL-identified strategies for promoting and advancing the teaching and development of social emotional skills, The Leader in Me employs 19. In addition to The Leader in Me initiative, Northville’s Amerman Elementary School also has been nominated, and is in the process of applying, to become a National Blue Ribbon School based on its overall academic excellence and progress in closing the achievement gap among student subgroups. The National Blue Ribbon School award affirms the hard work of students, educators, families and communities in creating safe and welcoming schools where students master challenging content. 2019 Blue Ribbon Schools will be announced in September.